Ayurveda sees each thing, each person, as fundamentally connected. This holistic perspective allows the practitioner to find connections where science draws only blanks, as well as provide natural treatments that leverage the power of nature, food and spices. Ayurveda, or ayurvedic medicine, is a holistic tradition of medicine from South Asia, particularly India, that uses a systemic and highly complex model of health, disease and health restoration. For thousands of years, since before written alphabets existed, the peoples and cultures of India have been among the world's most keen observers of nature, accumulating immeasurably vast quantities of knowledge of healing. Over countless generations, since before India's sacred scriptures, the Vedas, were composed, the scholars and seers of that ancient country set about compiling the totality of these observations of the natural world and elaborating their practical applications. Precisely how old Ayurveda is has been the subject of conjecture. The development of Ayurveda or of any science is a part of human evolution, involving the unfolding of curiosity and the increasing sophistication of human intelligence, synthesis, and observation. One cannot put a numerical age on Ayurveda since it began to evolve long before writing existed. When ayurveda is dated, it is on the basis of writings 3,000 to 5,000 years old although it undoubtedly far predates those writings. Among the objects of their most intensive study and interest were issues of practical application: agriculture, animal husbandry, astronomy and the human body and mind - specifically, the means for maintaining their good working order and the means for their cure when either fell victim to disease or injury. The sum of the knowledge gained from their millenia-spanning study is known in Sanskrit as Ayurveda or in English, the science of life. In India and throughout south Asia, Ayurvedic medicine is taught in universities and medical colleges on an equal footing with western medicine, and qualifications for the practice of both disciplines are virtually identical. 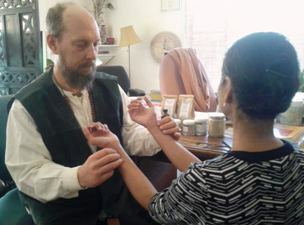 Governmental, academic and commercial support is devoted to research in specific areas of Ayurvedic medicine and the development of new forms of therapy. Ayurveda's most distinctive features are its reliance of primarily natural remedies to treat and natural means to avoid disease, it's extremely sophisticated system of diagnosis, and its categorization of patients into distinctive anatomic and metabolic types. Ayurveda describes the existence of three fundamental types of the human metabolism, known as dosas (pronounced, and sometimes spelled doshas) and somewhat like the western medical concepts of endomorphic, mesomorphic and ectomorphic body types. These are together known as the Tridosa, or three categories, and include the Kapha, Pitta and Vata. Regimens for maintaining health and for its restoration vary from one type to the next. The value in knowing one's dosic signature lies not only in knowing what kind of diet or lifestyle to practice to ensure optimal health, but also in knowing what one's vulnerabilities are, i.e., the kind of disorders that are likely to arise and the means for dealing with them successfully. Ayurveda was brought to the North American continent with the wave of Indian immigration in the 1960's and 1970's, to whom its practice was largely confined until the mid 1980's when the attention of the larger community was caught by the writings of Boston endocrinologist and Ayurvedic practitioner, Dr. Deepak Chopra. 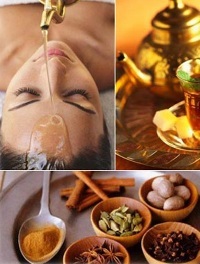 Today Ayurveda is increasingly one of the more widely known forms of traditional healing. Critical to its success has been the fact that Ayurvedic medicine has earned respect as a scientifically legitimate medical system around the world, and has been called by the UN's World Health Organization "an invaluable part of humankind's medical heritage and an important tool in the service and promotion of global health." Because it delivers incredible results where other systems of medicine often fail, Ayurveda is seeing a great resurgence in our era. There is also medical and layperson acknowledgement of the health benefits of Ayurvedic practices, such as yoga, massage, and meditation . Herbs used in Ayurvedic medicine, such as turmeric, ginger, and neem, are now recognized as beneficial for various health conditions and as antioxidant-boosters. Ayurveda is recognized by the World Health Organization. 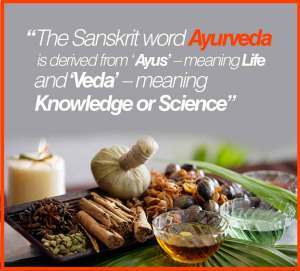 The WHO recognizes Ayurveda as a traditional system of medicine. In fact, the Organization adapted its formal definition of health from Ayurvedic teachings. Whereas our modern medical system is relatively new, and therefore, continuously in a state of change and flux, Ayurveda, India’s ancient medical system, has been around for 5,000 years, proving as effective today as it was thousands of years ago.